The 25 GHz (K-band) +GF+ 2290 Pulse Radars are the most progressive Non-contacting Radar Level Transmitter for industrial processes. With an excellent accuracy, compact antennas and a user-friendly set-up the 2290 is an effective, simple, low cost choice for demanding level applications. GF’s new K-band radar featuring 3 mm (0.1inch) accuracy and short dead band excels with its robust full plastic housing. Its antenna range incorporates a stainless steel horn and enclosed plastic tube choices. The enclosed antenna versions can be replaced without removing the antenna enclosure from the process. Local programming of type 2290 is aided by a plugin display module. The signal processing algorithm of the 2290 is based on years of experience with non-contact level measurement making it an excellent choice for applications simple and challenging alike. The operation of the non-contact microwave level transmitters is based on the measurement of the time of flight of the microwave burst. The propagation speed of microwave impulses is virtually the same in air, gases, or a vacuum and is independent of the process temperature and pressure, so the measured distance is not affected by the physical parameters of the medium to be measured. The level transmitter produces billions of microwave pulses per second, emitting from the antenna with a 19° focus the energy is reflected by the process media. The time of flight of the reflected signal is measured and processed by the electronics, and then this is converted to distance, level or volume proportional data. The measurability of a particular medium is dependent upon strength of the reflected signal which varies considerably based upon such factors as distance, dielectric constant, and surface turbulence. The relative dielectric constant (r) of the medium should be greater than 1.9. 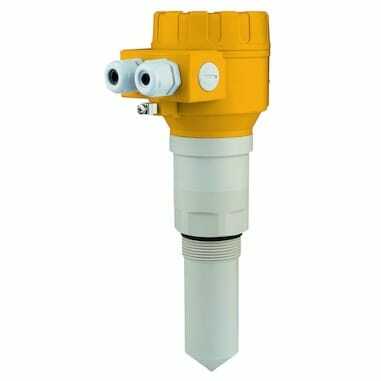 The +GF+ 2290 Pulse Radars are the most progressive Non-contacting Radar Level Transmitter for industrial processes. With an excellent accuracy, compact antennas and a user-friendly set-up the 2290 is an effective, simple, low cost choice for demanding level applications.